Hey, you want to watch a movie about putting jigsaw puzzles together? Nah, not like a life-or-death jigsaw puzzle like in some adventure movie or something, just a typical puzzle you might piece together on a lazy night in. Well, you might want to after watching the trailer for Puzzle, a film which earned top marks at Sundance earlier this year for the lead performance by Kelly Macdonald, who is pretty much good in everything. 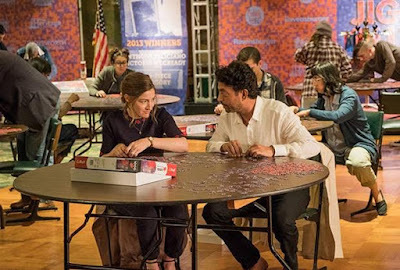 Directed by Marc Turtletaub and co-starring the great Irrfan Khan, Puzzle finds Macdonald as a sheltered suburban housewife who finds a new passion when she receiveds a 1000-piece jigsaw puzzle as a gift. Turns out she's REALLY good at puzzles, and it helps her piece together the fragments of her life. Khan plays a puzzle champion in need of a partner for an upcoming competition. Turtletaub is a longtime producer (Jack Goes Boating, Safety Not Guaranteed) directing only his second feature. His first, an adaptation of the satirical novel Gods Behaving Badly, was never released despite a star-studded cast. Not the kind of background that inspires at ton of confidence but the reviews for this have been through the roof. And this looks like such a perfect role for the understated Macdonald, who has been a gift in everything from Trainspotting to Intermission to No Country for Old Men and many more. Puzzle opens on July 13th.